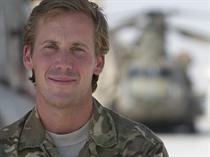 "Flight Lieutenant Wyatt, captain of a high readiness Chinook, was scrambled to recover a military casualty with a life-threatening gunshot wound to the neck, when it soon became clear that the landing site was compromised. "Putting the needs of the casualty above his own safety, Wyatt elected to keep the aircraft on the ground long enough to recover the injured soldier, despite continuous incoming small arms fire. "The Force Protection (FP) Team was immediately deployed to support friendly troops and the casualty was recovered by the Medical Emergency Response Team (MERT) and crewman. As the FP Team recovered to the aircraft it emerged that one member had been shot in the shoulder and required urgent treatment. "Wyatt kept his nerve under a hail of ground fire, lifting only when both casualties were safely on board. "Unfortunately the aircraft had sustained significant damage, losing critical radio and electrical services, and a significant oil leak had begun from the rear transmission. The aircraft began to vibrate, making handling difficult. "With no further options, Wyatt transmitted a mayday distress call and landed in the desert whilst he still had control of the aircraft before directing his crew to cross load casualties and the remainder of the MERT to a supporting helicopter. He then elected to remain with the aircraft to erase critical mission information and remove sensitive equipment before being recovered by a third aircraft ten minutes later. "Wyatt's selfless actions undoubtedly led to the saving of the casualties' lives. His professional performance under persistent enemy fire and his outstanding bravery and airmanship are an example to all."